The CleanFinancial.com guide to stock market index spread betting. Where Can I Spread Bet on Indices? Where Can I Trade Stock Market Indices for Free? Where Can I Practice Trading Indices? How to Spread Bet on Stock Market Indices? A spread/price comparison table looking at the 'spread size' and minimum stakes for the most popular stock market indices. Comparison Notes. This table is not meant to be inclusive, index spread betting may be available through other brokers. The latest Commitments of Traders Report (COT) has been published by the CFTC and so we have produced a new Stock Market COT Summary Report. We have also updated our individual COT reports for the futures markets listed below. These are easier-to-read than the CFTC version. They also have additional long/short ratios data and give the weekly net positions changes. For more international stock markets see our Index Price Table. For more global indices see our Stock Market Price Table. 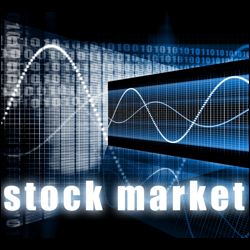 For the stock market commentary archives see Stock Market Trading Archive. Where Can I Spread Bet on Stock Market Indices? Clean Financial readers should note that you may be able to spread bet on stock market indices with other brokers. We do give readers some fairly accurate prices for the daily index markets, please see stock index prices above. The live CFD chart and prices below will offer readers a useful look at the FTSE 100 (UK 100) stock market index. You can use the search option on the chart to select other indices like the Dow Jones (USA 30), S&P 500 (USA 500), DAX 30 (Germany 30), etc. The above chart, provided by Plus 500, usually follows the FTSE 100 futures market (not the spot market). If you want to study live spread betting prices and charts for the stock market, then naturally, one option is to use a spread betting account. 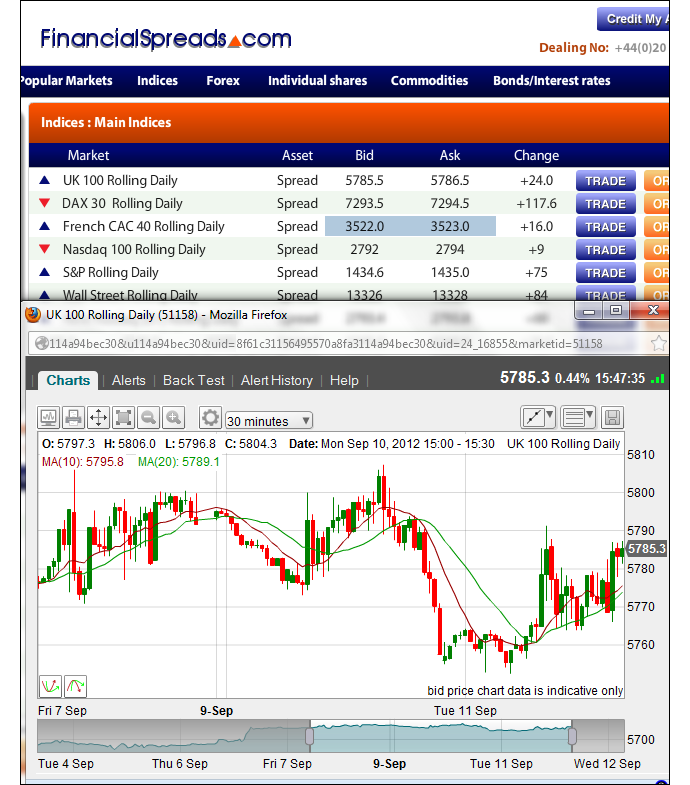 A spreads account would also give you access to daily markets. Users should note that accounts are subject to credit, suitability and status checks. If you apply, and your application is approved, you can log on and use the live charts and prices. These are usually provided for free. Of course, if you decide to trade then, before you start, you should be aware that spread trading and contracts for difference involve a significant level of risk to your capital and it is possible to incur losses that exceed your initial investment. Where Can I Spread Bet on Stock Market for Free? Investing in the stock market always has its risks, but if you want a free Practice Account, which lets you try spread betting, see below for more details. Also, don't forget that in the UK, spread betting is exempt from capital gains tax, income tax and stamp duty*. The above companies provide a Test Account that lets investors try out new trading ideas, review professional charts and practice with an array of trading orders. Many investors prefer daily markets to futures markets. In the trading examples below we cover both daily and futures. A 'Rolling Daily' market is unlike a futures market in that there is no closing date. If you decide to leave your trade open at the end of the day, it simply rolls over to the next trading day. A ‘futures’ market will normally have a wider spread than a ‘daily’ market. However, you do not normally have ‘daily rolling’ costs with a futures market. Having said that, if you are trading a quarterly futures market, i.e. a market that closes at the end of the quarter, and you want to keep it open past the expiry date then you will often incur a small cost at the end of the quarter. Importantly, if you plan on doing this, you need to tell your spread betting company in advance, i.e. before the contract expires. How to Spread Bet on a Stock Market Index? An index is a statistical indicator that represents the total value of the stocks that constitute it eg the FTSE and Dow Jones are both indices. It often serves as a barometer for a given market or industry and acts as a benchmark from which financial or economic performance is measured. As with many global markets, you can spread bet on a stock market index to rise or fall. Whilst placing a spread bet on the FTSE 100 index you trade in £x per point. Therefore, if you choose to have a stake of £3 per point and the FTSE 100 moves 32 points then that would be a difference to your P&L of £96. £3 per point x 32 points = £96. If so, you might want to buy a spread bet at 5820.7 for a stake of, let’s say, £4 per point. With this trade you make a profit of £4 for every point that the FTSE 100 index moves above 5820.7. Conversely, however, you will lose £4 for every point that the FTSE 100 market drop below the 5820.7 level. Or, in other words, if you were to buy a spread bet then your profit/loss is worked out by taking the difference between the closing price of the market and the price you bought the market at. You then multiply that difference in price by your stake. If, after a few hours, the UK stock market rose then you might consider closing your position in order to lock in your profit. Speculating on stock market indices won't always go to plan. In this case, you wanted the UK index to rise. Of course, stock markets can fall. If the FTSE 100 market began to fall then you could close your trade in order to limit your losses. Note: FTSE 100 Rolling Daily market quoted as of 28-Nov-12. Let's say a firm is offering a FTSE 100 Futures price of 6202 - 6206, i.e. you can 'buy' at 6206 or 'sell' at 6202. You think the FTSE is going to go down, so you 'Sell'. Let's say Wall Street, i.e. the Dow Jones, has been gaining steadily but you feel the current level of 12215 is a medium term high. Therefore you could have a look at Wall Street Mar (March) and see the quote is 12331 - 12345. Therefore you decide to SELL (go short) at 12331 for a stake of £5 per point. You have Sold but the even if the price does increase you will still make a profit as long as it doesn't go above 12331 from the current level of 12215. Let's say you're not quite right and the market continues to go up but only a fraction and in March it settles at 12290. Your profit is calculated by calculating the difference between the closing level (12290) and the opening price (12331) and multiplying that by your stake. However had Wall Street continued to increase at a greater rate and closed at 12360, you would have lost. Note: Wall Street market as of Jun 2012. Advert: Stock Market Spread Betting, sponsored by FinancialSpreads.com. You can spread bet on the Stock Market with Financial Spreads. 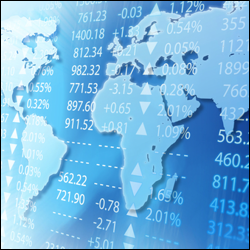 Below we have listed guides to the worlds’ major stock markets. The guides for the more popular stock market indices have real-time prices and charts as well as regular market updates and analysis. Less popular and therefore the ‘spreads’ tend to be wider i.e. the underlying market has to move further before you can close your trade for a profit. More volatile and more likely to ‘gap’ or ‘slip’ than a liquid index like the FTSE 100 or Dow. When studying the CFTC COT reports, investors will often concentrate on the Non-Commercial commitments and the Change in Open Interest. Therefore, every week, we publish the latest data in the following ‘Summary Non-Commercial and Open Interest COT Report’. For the full COT report for a particular stock market index, and to see how traders are altering their positions, just click on the relevant link in the summary table below. Also see our Commitments of Traders guide. FTSE 100: The index that highlights the performance of the UK's top 100 companies, as ranked by their market capitalisation. The FTSE 100 is normally the most popular spread betting market and a number of firms offer 24 hour trading from Sunday evening to Friday evening. In spread betting, the FTSE 100 is also referred to as the ‘UK 100’. FTSE 250: The index of the next 250 UK companies, after the top 100. The FTSE 250 is sometimes referred to as the ‘UK 250’ or ‘FTSE MID 250’. FTSE 350: The index of the top 350 UK companies by market capitalisation. It is a combination of the FTSE 100 and FTSE 250 stocks. You cannot normally trade a FTSE 350 market in spread betting. Dow Jones: An index of 30 of the most traded US stocks. In financial spread betting and CFD trading this market is also known as the ‘Wall Street’ index. Like the FTSE 100, it is extremely popular with spread bettors. S&P 500: Defines the broader US equity market, tracking the performance of the top 500 US companies. Sometimes referred to as the ‘SPX 500’ or ‘US 500’. NASDAQ 100: NASDAQ stands for the National Association of Securities Dealers Automated Quotation System. The NASDAQ 100 is an index that reflects the performance of high tech stocks in the US. Sometimes referred to as the ‘US 100’ or ‘US Tech 100’. Nikkei 225: The price-weighted average of 225 stocks of the first section of the Tokyo Stock Exchange. Sometimes referred to as the ‘Japan 225’. For more details on an individual index see our individual stock market guides above. Below, an older but still useful case study on the FTSE 100 by Shai Heffetz, InterTrader, 31-Aug-2011. Looking at the candlestick chart below, we can see that up to the end of July 2011 the FTSE 100 was trading within a narrow range and staying reasonably close to the Ichimoku cloud. At the beginning of August, it broke downwards out of this range and the price started to drop sharply. It continued to drop for nearly a week, during which time it went down by nearly a thousand points to well below 4,900. Following that we saw a relatively strong recovery to just below 5,400 on 16 August and then another downward correction. The FTSE 100 price is presently trading sideways without any clear direction. From a pure technical analysis point of view, traders should adopt a wait-and-see approach before taking any positions in the market. The price is currently trading inside the cloud of the Ichimoku Kinko Hyo, which is a clear indication of market uncertainty. The FTSE has continued to get closer to the upper border of the Ichimoku cloud. However, whilst the green Chinkou Span line is marginally above the price of 26 periods ago, this is not enough of a reason to enter into a long trade. Taking into account the recent volatility in the market, if it breaks out of the cloud in an upwards direction a cautious trader would wait for a second, confirming signal before entering a long trade. This could be when the blue Kijun Sen line also breaks out of the Ichimoku cloud in an upwards direction. On the other hand, traders who are looking for a short trade should wait for the price to drop below the recent lowest level of 4,846. Where Can I Find a Stock Market Index Trading Platform/Software? Some of the spread betting firms offer software/trading platforms that you have to download and install onto your computer. Most firms however, offer web based platforms that allow easier access from home, the office and most other places with internet access. The companies listed in our price comparison section all have web-based platforms where you can spread bet on indices and individual shares. Stock market index spread betting guide with live prices & charts. Plus daily stock market analysis, an indices spread betting price comparison, tips on where to trade commission-free and tax-free* as well as... » read from top.